Over the past few weeks ive been contributing and editing on steemcentrewiki https://www.steem.center/ and have earned 71.679 steem so far. 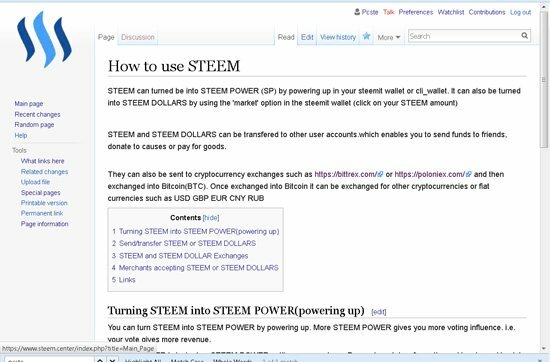 Steemcentrewiki is run by @someguy123 and is a wiki site to learn about steem, steemit and all things related. If you like the idea of steemcentrewiki please consider sending a donation of steem or sbd (no matter how small) to @steemcenterwiki. Donations will be distributed between all contributors and those involved and will keep the project moving forward. Please consider voting for me on the witness page. I would like to just cover my witness server costs atm. your votes will help me move up the ladder to a position wher my cost can be covered. in return i promise to be a good steemian and contribute to the community. Is this a steem based app or just a regular mediawiki wiki about steem?